I know it’s nearly two months ago, but I feel I must start these notes with a farewell to Sir Patrick Moore. His love of astronomy was matched only by his love of a good party. The Universe is an emptier place and The Sky At Night will never be the same. He did like to encourage people to go out and look at the night sky, though, and this month is the best time of year for doing just that, as it is full of superlatives. 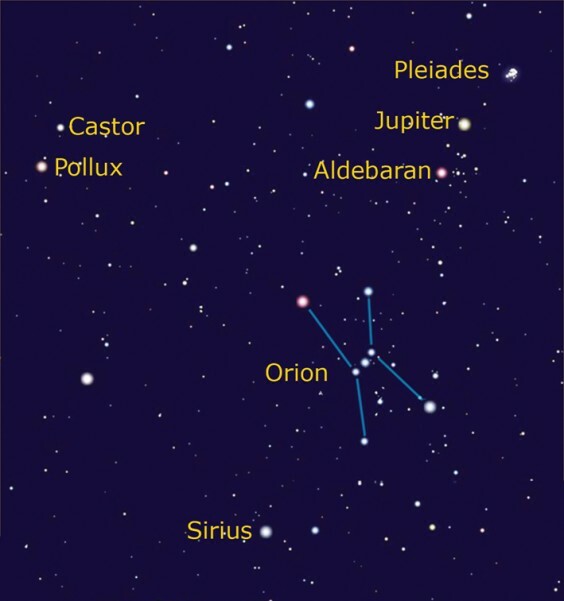 The first thing that leaps out of the sky, directly south from about 7pm, is just about the largest constellation that is well-defined: Orion. Looking much larger than it would appear from the accompanying chart, the three stars of the belt are immediately obvious, as are the stars of the sword hanging down from them. The middle star of these is actually a tight cluster of stars, one of which is the hottest star in the sky. They all sit in front of, and illuminate, a cloud of gas, forming the Orion Nebula – visible as a sort of “fuzziness” around them. The top left hand star of Orion is the biggest star you will ever see: Betelgeuse. This is the granddaddy of red giants and varies in a rather unpredictable way, as if it is getting ready to explode in a supernova. Just below and to the left of Orion is the brightest star in the sky (unless Betelgeuse does erupt). This is Sirius in the constellation of Canis Major, one of Orion’s hunting Dogs. This too, is a very hot star, giving it a distinctive blue colour. Above and to the left of Orion, beyond Betelgeuse, is a pair of stars at the head of the zodiacal constellation Gemini. These two seem to generate the most amusement of all the stars but I have never understood why. They are Castor and Pollux and the lower of the two, Pollux, is the smallest and nearest red giant in this part of the sky. It is known to have a planet the size of Jupiter orbiting it. To the right, at a similar height above Orion, is the eye of Taurus the Bull. This is Aldebaran, the colour of which gives it away as another red giant. Higher and further right is the largest planet you will probably ever see. This is Jupiter, certainly the brightest object in the sky and well worth viewing through binoculars to spot its four moons changing position on a daily basis. Moving up and right a similar distance again, we come to what is, for me, the most beautiful sight in the sky. This is the Pleiades or Seven Sisters. Through binoculars, this little gathering of obviously blue stars can be seen to be sitting in the cloud of gas from which they were formed. They are thought to be so young that the early dinosaurs would not have seen them (well, binoculars hadn’t been invented then!). Finally, from about the 6th, we get our best chance of spotting the smallest planet in our Solar System: Mercury. Start looking into the sunset from about 5.30pm but make sure the Sun has definitely set. Mercury will be very low and getting lower, disappearing by 6.30pm. A very thin crescent Moon will be alongside on the 11th, which will help locate the planet – and by the 20th, it will, again, be too close to the Sun. So get out and get to know our night sky. It’s what Patrick would have wanted!